Looking for the perfect Groomsman or Best Man gift idea which is classic yet modern, meaningful yet useful and honest yet still says you couldn’t tie the knot without your best friends by your side? The Frederick James wedding pocket watches are the Groomsman gifts or Best Man gift you’ve been looking for. Complete with a stylish black gift box, the Frederick James Best Man/Groomsman pocket watches boast delicate etched engraving containing the meaningful words “Best Man for a day, Best Friend for life”, or “To my Groomsman, Thank you for being a part of our special day”. The watch is polished stainless steel, with Quartz engineering, roman style watch face and is complete with a 45cm chain and clip.  GROOMSMAN GIFTS KEEPSAKE – Do you want to give your Groomsmen gifts to forever remember your special day? 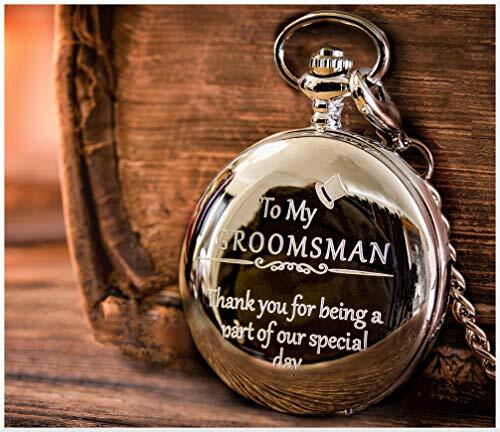 Our “To my Groomsman, Thank you for being a part of our special day” pocket watch is the perfect Groomsman gift to create a moment they’ll always remember.  EXQUISITE DESIGN – Polished steel pocket watch with delicate etched engraving, 45cm steel chain and precision Quartz movement. A truly unique gift.